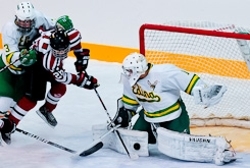 After sharing time between the pipes during the regular season, Edina goaltender Connor Girard carried the Hornets to the Class AA state title last winter. He completed a terrific playoff run with 23 stops in a 4-2 victory over top-ranked Minnetonka in the final, including several spectacular glove saves. Now a senior, Girard is the unquestioned backstop in the Hornets’ defensive zone and a key to their hopes of repeating. We caught up with Girard recently to ask him about last year’s championship run, what makes him a top goaltender and what the Hornets can do for an encore. Question: Tell me about winning the state championship last season. After being the favorite the year before, the Hornets weren't expected to win last winter. How did it feel to come through as you did? Elation? Satisfaction? Pride? All of the above? Answer: It’s pretty special that we are one of 10 teams to win at Edina, and I take pride in that. What made it sweeter was that it was the coaches' first one and that was one of the first things that came to my mind after we won. We had struggled at a point in the season and to finish they way we did shows the character that our team had. Q: An obvious turning point seemed to be that game against Minnetonka in which you were down 4-0 after one period and came back to win. Did the team see it that way at the time? Was there any "Ah, ha!" moment with that game where you realized it had come together? A: We had struggled for a bit up to that point and we looked to this game as one where we could come in against a team that hadn't lost as an opportunity to gain confidence. We didn't get out to a good start and we were not able to shut down their power play in that first period. We went into the second looking to build off anything, we killed a couple of their power plays early on and just took it one shift at a time, which worked for us. We had to work as a team the last two periods and I think that's what changed for us the rest of the season. A: We worked hard. We had a group of selfless guys who weren't concerned with points or getting credit, but to help the team win, whether that be blocking shots or back checking. We had good senior leadership. The most important things we did right were the little things, which made a big difference for us in the end. Q: Personally, you earned all the playoff time and came through with some great performances. How confident were you entering the playoffs? What did the coaching staff do or say to let you know that you were "the man?" A: I thought the coaching staff handled it great. They keep it consistent, we didn't know who was playing until the practice the day before a game and that made me more competitive in practice. I did have more confidence going into playoffs because I had played 4 games in a row towards the end of the regular season, but I still didn't know who would play the first playoff game. All the coaches said was to keep playing like I had been. Q: How would you describe your development as a goaltender through the season? A: I learned a lot and matured through out the season. I became more aware of what my strengths and weaknesses were and figured out what I needed to do to play my best consistently. Q: What does Edina (and yourself) do for an encore? A: We want to win it again, that's our ultimate goal. Going into this year I want to win it more than last year. A: It’s hard to single my favorite thing, but playing at Braemar, in that atmosphere, is something that I've looked forward to a lot in the off-season. Q: Can you give me a quick scouting report...what are your strengths as a goaltender? A: I'm aggressive, play big, good down low, movement, quickness, and ability to read the play. Q: What kind of in-season and off-season workouts/training do you do to prepare? A: Off-season I worked out and skated at FHIT at St. Thomas Academy. It was good for me because I was able to go in everyday knowing there would be a workout for me and the guys there are easy to work with. As for in-season training, I will continue to do the workouts that FHIT provides. I also do individual goaltending training with Peter Samargia. Q: What other activities are you involved in at Edina? Do you play other sports? Other extracurricular activities? A: Hockey and school take up a lot of my time. Q: What type of plans do you have for hockey after you graduate? Do you have any offers out there? A: I plan to play hockey after high school. I've set a lot of goals for myself that pertain to hockey after I graduate, but all I need to focus on is playing well and things should take care of themselves.